Biscuits and gravy for breakfast? Hamburgers for lunch or dinner? How about hand-breaded chicken strips? Hardee’s will host its ribbon cutting at 10:30 a.m. today at 102 Holiday Frontage Road. The first 25 customers will receive a gift certificate for a free biscuit each week for the restaurant’s first year. The restaurant also plans to hire about 10 more employees in the coming weeks, to have a team of about 30. The restaurant, next to a new Fat Dog’s gas station, is on the site that was once home to a Taco Bell. Doors open at 7 a.m. for breakfast. 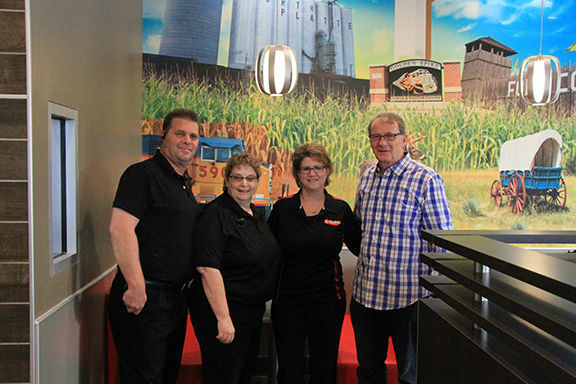 The restaurant is known for biscuits that are made from scratch daily, croissants, gravy and biscuit breakfast sandwiches, said Kelly Lindley, director of marketing for Westar Foods Inc., which owns this Hardee’s franchise. “We like biscuits,” Lindley said with a laugh. After 10:30 a.m., customers can purchase angus beef “thick burgers” and hand-breaded chicken tenders. “They literally go in and hand-bread each and every piece,” Lindley said. Lindley said Hardee’s locations already exist in Omaha, Elkhorn, Fremont, Council Bluffs and Grand Island. The franchise also has locations in Iowa and Kansas. “This is about as far west as we can possibly go,” said Frank Westermajer, president of Westar Foods Inc. He added that locations farther west gets into the territory of Carl’s Jr., which is a sister company to Hardee’s. Both Lindley and Westermajer said they’ve heard positive things about North Platte’s community. “North Platte’s been on our minds for quite a while,” Lindley said. Westermajer said the franchise hopes to expand along the Interstate 80 corridor. “North Platte is one of those communities we want to be in,” he said.